Philip Cotton is one of the UK’s leading experts in 3D printing in education and the founder of 3Dfilemarket.com — a space for designers to share cutting-edge, fully printable designs. 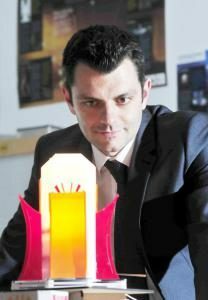 Philip currently teaches Product Design at Ladybridge High School, where he provides pupils with hands-on experience of 3D printing and its applications. He was winner of the 3D Printshow Educational Excellence award in 2013 and 2014, and is widely in demand as a consultant and writer on 3D printing and its potential applications across the field of education. Through the National Stem Centre in York, he offers guidance and support to other educators who are interested in exploring 3D printing technology’s potential in the classroom. Philip was kind enough to sit down with RP Platform to share his thoughts on the state of 3D printing and what the future may hold for the technology. RP Platform: How did your interest in 3D printing originally come about? Philip: My interest in 3D printing came about when I was looking for new technology to teach in school. I started to teach Design and Technology to high school students and I wanted something new that would excite the classroom. I felt that it was important that students were taught the most relevant new technology out there, and 3D printing really ticked all the boxes. I had never seen anything like it before and I thought “Wow, if I was a teenager, then this is what I would want to learn about”. I wanted my curriculum in school to be exciting and unpredictable rather than safe and mundane, and 3D printing was a perfect candidate for this to happen. I also thought about how smartphones had changed our lives over the past decade. After seeing 3D printing, I knew that this would be the next game-changer. RP Platform: What do you see as the key drivers for introducing 3D printing in schools? Philip: The key drivers for introducing 3D printing into schools are funding and teacher training. The school has to be able to adequately fund the technology and also have the infrastructure to run the technology, e.g. computer rooms that can host full classes of 25 students who have access to the latest CAD technology. Luckily Autodesk is widely accessible, as it is free to use in education and students can download it for free at home. Staff training is key as well. To just hand a 3D printer to a teacher and expect them to embrace it and change the curriculum can be a daunting task. Teachers need to be given training on the technology and also have the knowledge of what to teach the students. When I first started 3D printing, there wasn’t anything for teachers. I couldn’t even find another teacher who was using the technology, so I was really in the deep end. Now, five years later, there are some excellent training courses out there. I was lucky enough to have been asked to provide one for the National STEM Centre in York University, based upon the experience that I had gained over the past five years. So if you are a teacher wanting to know how to implement the technology in the classroom, check out the National STEM Centre for more information. RP Platform: How do you see 3D printing evolving within the education sector in the near future? Philip: I see it becoming more mainstream and I would hope that within five years time, every school will have a 3D printer. With the cost of the technology becoming cheaper by the day, there is no reason why all schools can’t adopt it. Once it is embedded in high school, then it will grow further into higher education and the standard of students using the technology at university level will be at a higher level than it currently is. RP Platform: What are the primary obstacles you see when institutions are exploring 3D printing for the first time? Philip: The obstacles are funding, staff training, time, and the reliability of printers. FDM-style 3D printers are getting better all the time, but they do have their quirks. Once these are ironed out and the variables in 3D printing are reduced, then mass adoption will follow. As mentioned above, the main obstacles are funding and staff training. Philip: Some of the most creative applications of the technology I have seen haven’t been on the website, but rather in real-life situations. A few years ago at the 2013 3D Printshow in London, there was a 3D printed fashion show, with examples of 3D printed art from Joshua Harker that were quite simply mind blowing, and I haven’t really seen anything that has rivalled it since in terms of creativity. The use of 3D printing in art and fashion is only just beginning and there is huge potential in this area in terms of creativity. Look at the creativity on the 3dfilemarket — there have been some amazing designs uploaded and shared by the community which are mostly free. Designers such as ‘walltosh’ and ‘gcreate’ have shared some truly amazing, creative designs that really showcase the power of 3D printing. RP Platform: What recent developments in 3D printing materials and technology are you most excited about?